Is India's Economic Crash Likely in 2011? Pakistan's economy had a hard landing in 2008. It was triggered by a balance of payments crisis brought about through precipitous decline in foreign capital inflows combined with policy inaction in response to major external shocks in terms of food and fuel prices during political transition. Is the Indian economy similarly vulnerable in 2011? Is it headed for significant slowdown in the next twelve months? And if it is, can the Indian leadership manage a soft landing through major policy actions now? 1. India's current account deficit widened sharply to $13.7 billion in the June-quarter, which was around 3.7 per cent of GDP. The deficit was $4.5 billion in the same period year ago. 2. India's FDI has declined by a third from $34.6 billion in 2009 to $23.7 billion in 2010. Its current account deficit is being increasingly funded by short-term capital inflows (FII up 66% from $17.4 billion in 2009 to $29 billlion in 2010) rather than more durable foreign direct investment (FDI), posing a risk to external balance and funding of gap, according to a recent warning by Goldman Sachs. "Nearly 80 per cent of the capital inflows are non- FDI related. Given the excess spare capacity globally, FDI may remain weak going forward," the Goldman note said. 3. Inflation in India is running at a double digit pace as is credit expansion. India's primary articles price index was up 15.35 percent in the latest week compared with an annual rise of 13.25 percent a week earlier, data on Thursday showed. Year-over-year credit growth was 23 per cent till December 3, while deposit growth was only 15 per cent, as compared to RBI's projection of 20 per cent and 18 per cent, respectively, for 2010-11. 4. India's Food and fuel prices are continuing to rise by double digits. The food price index rose more than 12 percent, with the price of onions -- the country's most widely-eaten vegetable -- of especial concern, while the fuel price index climbed 10.74 percent. This compared with 9.46 percent and 10.67 percent respectively in the previous week. 5. The oil prices are likely to spike as the American and European economies recover in 2011, prompting Indian commerce secretary Rahul Kullar to acknowledge that “I am not sanguine. One blip on crude prices and my import bill suddenly zooms. On pro-rata basis we are looking at $ 120 billion with a caveat that if oil prices go up, it could be $ 130-135 billion”. Crude oil prices are currently running at $ 87-88 per barrel. While China's situation is better because it enjoys significant current account surpluses and has strong capital flow controls, it is also seeing its economy overheat along with India's economy. Joseph Stiglitz, a Nobel Laureate Columbia University economist, has argued that India is more vulnerable to an asset bubble than China, saying that “strong economies that don’t yet have capital control become the focal point” for the liquidity injected by the US Federal Reserve. Stiglitz thinks that India, more than China or Brazil, should watch out for the tidal wave of money made available from the Fed’s quantitative easing. Mike Shedlock, an American investment advisor, believes that "India and China are going to overheat and crash, or their economic growth is going to slow dramatically, quite possibly both". Indian President Pratibha Patil said last week that she is confident the economy will grow at about 9 percent in the current fiscal year ending March 2011 and would be on a sustained growth path of about 9 to 10 percent in FY12, according to Reuters. It is quite surprising that the Indian government continues to talk about increasing levels of economic growth in 2010-2011 and beyond amidst growing inflation and rising imbalances in the Indian economy. What they should be thinking about now is how to manage a soft landing by reducing liquidity and cutting India's twin deficits, rather than stepping on the accelerator and risk a big economic crash with long term negative consequences. Goldman Sachs has clearly contributed to the euphoria about India, by projecting that its economy could be 50 times its 2006 size by 2050, which would make it the world's third largest, after China and the United States. However, Goldman's Jim O'Neill has also said that when he ranked countries by the potential risks to their growth — everything from inflation to corruption — India ranked 97th in the world, behind Brazil and the Philippines. London-based Maplecroft terror risk index based on 2009 data ranks Iraq first, Afghanistan second, with Pakistan and Somalia third and fourth respectively. They are rated at extreme risk along with Lebanon 5, India 6, Algeria 7, Colombia 8 and Thailand 9, according to Reuters. "Post the 1991 BoP crisis, policymakers in the country have ensured that the current account deficit does not rise above 2% of GDP, a kind of self-imposed prudential limit. However, the dynamics of current account have changed over the past two years. 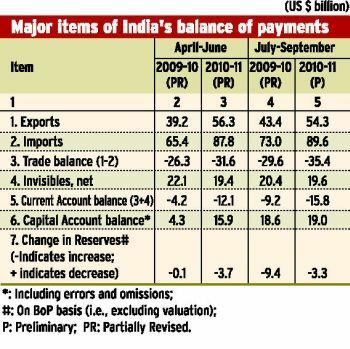 In 2008-09 , for the first time since the 1991 BoP crisis, India’s current account deficit widened to more than 2% of GDP (2.4%). In the first half of 2008-09 , a large spike in crude oil prices in mid-2008 to $145/bbl pushed oil imports up suddenly. Oil balance (imports less exports) deteriorated to 5.4% of GDP in 2008-09 from 4.3% of GDP in 2007-08"
Samie Modak (of Credit Suisse)"
"Foreign Direct Investment (FDI) inflows into the country between January-October this year aggregated $17.37 billion, compared to $23.8 billion in the corresponding year-ago period, translating into a 27 per cent decline." "The latest balance of payments data published by the RBI, however, puts the figure (of NRI remittances) at $55 billion. Remittance flows currently constitute around 4% of India’s GDP. Between 2004-05 and 2008-09 , private transfers on average financed 48% of the merchandise trade deficit. " NEW DELHI: India's external debt has gone up by 12.8 per cent to $295.8 billion in the first-half of the current financial year (2010-11), mainly due to increase in overseas borrowings by corporates and appreciation of rupee vis-a-vis other major currencies. The long-term debt rose by 9.5 per cent to $229.8 billion, while the short-term debt increased by 25.8 per cent to $66 billion during April-September 2010. External debt stood at $262.3 billion at the end of March 2010, and increased by $33.5 billion during the April-September period. “The increase in external debt at end-September 2010 over end-March 2010 level was mainly on account of higher commercial borrowings and short-term debt,” Finance Ministry said in a statement on Friday. Rupee appreciation led to rise in external debt by $6.3 billion or 18.8 per cent of the total increase. Among the components of long-term debt, which accounted for nearly 80 per cent of the total debt, the share of commercial borrowings stood at 27.8 per cent. The share of Government debt in total external debt stood at 24.4 per cent or $72.3 billion as against $67.1 billion at the end of March 2010. The share of U.S. dollar in the external debt portfolio was 53.9 per cent at end-September, while that of NRI deposits 16.9 per cent. Multilateral debt accounted for 15.8 per cent of total debt at the end of September. The share of U.S. dollar denominated debt was the highest in external debt stock at 53.9 per cent at end-September 2010 followed by rupee (18.8 per cent), the statement added. India’s central bank may have to keep raising interest rates to combat persistent inflationary pressures, the International Monetary Fund’s mission chief to the country said. The Reserve Bank of India said Dec. 30 that threats to growth have “receded” and inflation risks “have come to the fore,” signaling it may tighten monetary policy further after boosting interest rates the most in Asia in 2010. Governor Duvvuri Subbarao, who increased rates six times in 2010, held off on raising borrowing costs in a Dec. 16 policy announcement as a record 1.1 trillion rupees ($24.3 billion) of share sales last year caused a cash squeeze in the banking system. IMF’s Takeda made the comments after completing an annual review of India’s economy, which was discussed by the IMF board on Dec. 22. In the board’s conclusions released today, the IMF said that the Indian economy is expected to grow 8.75 percent in the fiscal year ending March 31, and 8 percent the following year. The IMF staff report was not published. India’s benchmark wholesale-price inflation cooled to near a one-year low of 7.48 percent in November. The reading exceeds the Reserve Bank of India’s goal of between 4 percent and 4.5 percent. The Washington-based IMF also warned that capital inflows may increase more than India’s capacity to absorb them as growth remains “among the fastest” in the world and yields in advanced economies stay low. “While exchange rate flexibility would remain the first line of defense, reserve accumulation and macroprudential measures could be employed if strong inflows continue,” the institution’s board said in an e-mailed statement. ISLAMABAD -(Dow Jones)- Pakistan's inflation rate accelerated marginally in November as food prices soar, hurt by the unprecedented floods, raising the prospects of further monetary tightening by the central bank. The consumer price index--the main measure of price changes--rose 15.48% in November from a year earlier, said Asif Bajwa, secretary of the Federal Bureau of Statistics, during a news conference. This is quicker than the 15.43% rise in October. The index was up 14.44% from a year earlier in July-November. Pakistan's fiscal year runs from July through June. "The reading is slightly lower than our expectations but it could cross 16% in December due to a low base last year," said Khurram Shehzad, analyst at InvestCap Securities. Shehzad blames the high cost of food articles, driven by a rise in sugar and potato prices, for the uptrend in inflation rate. The data highlight intensifying price pressures in the economy fueled by a heavy damage to the farm and civil infrastructure due to the floods. Prime Minister Yousuf Raza Gilani warned inflation could soar to 20% as the government struggles to revive the economy from disastrous floods. Prices of food and beverages rose 20.54% from a year earlier in November, compared with a 20.06% increase in the previous month. They have a 40% weight in the consumer price index. The government had before the floods forecast economic growth at 4.5% in the current fiscal year. Economists reckon that the government will likely lower the estimate once it has a clear assessment of the extent of damage from the floods. The State Bank of Pakistan expects economic expansion of 2%-3% in the current fiscal year. At its last monetary policy review on Nov. 29, the central bank lifted the discount rate--its main lending rate--for the third time since July as it sought to tame inflation that it said will accelerate to an average 13.5%-14.5% in the current fiscal year, higher than the previous projection of 9.5%. Although economic growth is weak, economists say the possibility of more rate hikes cannot be ruled out as inflation continues to spiral. A large part of the country was submerged by the floods that killed thousands and left millions homeless. The widespread damage has severely crippled the economy that was already suffering due to unceasing violence in the country. India has announced a slew of measures to curb spiralling food prices. The prime minister's office said the government would review import and export of essential commodities and sell onions at a restricted price. Experts, however, say the measures are too little, too late and a repeat of already failed steps. Meanwhile, government data released on Friday showed that the wholesale price index (WPI) had risen to 8.43% in December - the highest in a year. This was attributed to the soaring price of vegetables, milk and other staples which took food inflation to 18.32% last month - the highest in more than a year. Admitting that food prices had risen to "unacceptable" levels, the authorities said it was proving difficult to manage inflation. A kilogram of onions, which usually costs 20 rupees in India, went up to 85 rupees (£1.20; $1.87) last month. It is now about 60-65 rupees a kilo after government intervention. The government said state-run stores would sell the vegetable at 35 rupees a kilo. The expected arrival of 1,000 tonnes of onions from Pakistan soon would also ease the situation, it said. The ban on export of onions, pulses, cooking oil and cheaper varieties of rice will continue. State agencies would also retail edible oil and pulses at a reasonable rate, the authorities said. Economists said the government had shied away from taking bold steps and that the steps would be unlikely to help much. In addition to significant foreign institutional investments (FII) in Karachi shares last year, the reports of surging remittances by overseas Pakistanis and the nation's growing exports are the only two other pieces of good news amidst an avalance of bad news on the economic front in Pakistan in 2010. 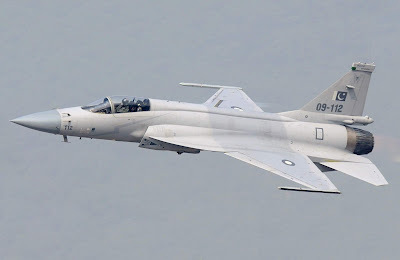 The State Bank of Pakistan has reported that overseas Pakistanis sent home $5.291 billion during July-Dec, 2010, an increase of $761 million or 17 per cent year over year, according to Pakistan's Dawn newspaper. Remittances of $863 million were sent by overseas Pakistanis last month, up 23.72 per cent or $165 million compared to December, 2009. Exports in the July-December 2010 touched almost $11 billion – $1.8 billion, or 20.6per cent, higher than last year’s exports in the corresponding period. Meanwhile, imports stood at $19.2 billion, marking a growth of 19.6 per cent, or $3.2 billion, in the first half, according to the Express Tribune. Pakistani government has been relying heavily on remittances by overseas Pakistanis to fund the massive trade imbalance, which exceeded $8 billion during the first six months of this fiscal. The increased remittances and rising exports have helped bring down the nation's current account deficit to $504 million for six months, or 0.6 percent of GDP, about 30% lower than the same period in the previous year. Foreign direct investment (FDI) declined 15.5 per centin the first six months of the current fiscal year to $828.5 million from $968.9 million in the same period last year, according to the Nation quoting figures from the State Bank of Pakistan. Pakistan’s current account surplus for July-December 2010 was a provisional $26 million, compared with a deficit of $2.570 billion in the same period last year, the central bank said on Tuesday, according to Dawn newspaper. In December, the current account stood at a provisional surplus of $601 million, compared with a deficit of $17 million in November, the State Bank of Pakistan said. 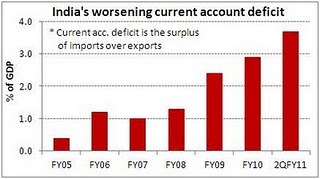 The current account deficit for the fiscal year 2009/10 was $3.946 billion, compared with $9.261 billion in fiscal year 2008/09. Here's a WSJ piece asking "Are India's central bankers hawks, doves, or just chicken? The Reserve Bank of India's decision to raise interest rates Tuesday surprised no one. Consider the context. The bank has made it clear fighting inflation is its priority and raised its own inflation forecast for the year through March to 7%, from 5.5% earlier. Paving the way for more tightening, the central bank said there is an upward bias to its projection of 8.5% annual economic growth. But the RBI still chose to raise rates by only a quarter point. This despite the fact that, at 6.5% now, India's key lending rate is still one percentage point below its average level from the last time India was growing so fast. The size of the increase is in line with what RBI Gov. D. Subbarao has described as "calibrated" tightening that started last March. Even if this made sense then, it no longer does, with India's economy on much more solid ground. That hasn't stopped the RBI from using concern over growth as its excuse for keeping rate increases slow. Moreover, the moves don't seem to have worked. After slowing for just two months last year, price gains have again picked up pace. As the RBI itself notes, inflation in non-food manufactured products remains above its medium-term trend. A recent rise in global food prices will add to the pressure, given the high sensitivity of consumer prices to food inflation. India's already high consumer-price index will rise 2.1 percentage points if global food prices go up by 30%, Credit Suisse estimates. The central bank has argued that its role is limited to preventing gains in food and energy prices from affecting prices of other goods. This would make sense if the rise in food prices in India was likely to be a short-term phenomenon that could be resolved with an adequate rainfall, as the RBI hoped it would last year. Even now, the RBI is hoping price gains will slow within the next six months. But food prices have been rising at a double-digit rate for more than two years, reflecting that this is driven by growing demand, as incomes rise faster than crop yields can be increased or new farm infrastructure built. Growth in demand, a product of India's economic rise, is something the RBI can slow with more-aggressive rate increases. There was relief in some quarters that Tuesday's increase wasn't bigger. Bonds, in particular, rallied following the news, indicating that traders had been bracing for something more severe. That will surely come to look like a short-sighted reaction, if the central bank finds itself having to raise interest rates higher and faster later to make up for its gradualism now. But Mr Singh said India's inflation rate of 8.4% - and food price inflation of 17% - was unsustainable. Analysts believe that surging food and oil prices mean that India's central bank may have to raise interest rates before its next policy meeting, which is scheduled for 17 March. India's stock market has fallen this year on fears that high inflation will scare off foreign investors. Wages in India are also rising as workers demand pay that keeps up with the cost of living. Mumbai, Dec. 31 Year 2010 saw foreign institutional investors buy Indian stocks for $29 billion net. This is the most that they have pumped into the Indian market in a single year despite the market-indices here being fairly range-bound during this period. This is also much more than the inflows ($17.6 billion) seen in 2007, when the Sensex was on a gaining streak. The markets did surge a little in 2009, too, when FIIs were net buyers for a total of $17.45 billion. Domestic institutions, on the other hand, were net sellers of equities for Rs 19,503 crore in calendar 2010. FIIs were also net buyers in equities in all months this calendar, except in January and May. August saw the highest net purchases in a single month this year for $13 billion. On a year-to-date-basis, the Sensex and the Nifty returned 15 per cent and 16 per cent, respectively. It was this relentless buying from the FIIs that pushed up the Indian markets in 2010. Though the Sensex did reach an all-time high this year, it was quite range-bound. The benchmark has been trading between 17,000 points and 21,000 points right through 2010. 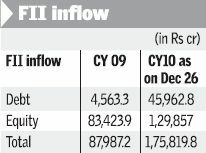 The buying spree on the part of FIIs slowed down in the last month amidst all the scams and the routine FII year-end exits when they need to pay their investors. Their net purchases during December has so far amounted to $0.3 billion only. “Part of this pullback is because India is perceived to be overvalued vis-a-vis other emerging markets. “Indian markets have enjoyed around a 30 per cent premium to the other emerging markets. But what has happened this year is that the scams have made FIIs start to question the rich valuations here,” said Mr Saurabh Mukherjea, Head of Equity at Ambit Capital. He added that the next year might see a moderation in FII inflows into the country. Domestic institutions were net buyers of equity during December and November after being net sellers for five consecutive weeks. Mr Mukherjea said that insurance companies have been seeing inflows trickling in during December and that the fund houses here are also in “slightly better health”. Mr K. Ramanathan, Chief Investment Officer at ING Investment Management, said that mutual funds faced a lot of redemptions this year and they did not get much incremental net inflows. “The changes in the regulatory framework too hurt the mutual fund industry. Distributors find it better to sell insurance products as the brokerage there is better than from distribution of mutual funds,” he added. The ratio of volatile capital flows—defined to include cumulative portfolio inflows and short-term debt—to the country’s forex reserves increased to 58.1% in March 2010 compared to last year’s 47.9%. According to the Reserve Bank of India (RBI), the ratio of short-term debt to the foreign exchange reserves declined from 146.5% in March 1991 to 12.5% in March 2005, but increased slightly to 12.9% in 2006. However, with expansion in the coverage of short-term debt, the ratio increased to 14.8% in March 2008, to 17.2% in March 2009 and 18.8% in March 2010. The country’s foreign currency assets are invested in multi-currency, multi-asset portfolios as per the existing norms which are similar to the best international practices followed in this regard. At end of March 2010, out of the total foreign currency assets of $ 254.7 billion, $ 132.1 billion was invested in securities, $ 117.5 billion was deposited with other central banks, BIS and the International Monetary Funds (IMF) and $ 5.1 billion was placed with the External Asset Managers (EAMs). A small portion of the reserves has been assigned to the EAMs with the main objective of gaining access to and deriving benefits from their expertise and market research, said RBI. The rate of earnings on foreign currency assets and gold, after accounting for depreciation, decreased from 4.82% in July 2007-June 2008 to 4.16% in July 2008-June 2009. The RBI held 557.75 tonne of gold forming about 6.0%of the total foreign exchange reserves in value terms as at the end of March 2010. Of these, 265.49 tonne are held abroad (65.49 tonne since 1991 and further 200 tonne since November 2009) in deposits / safe custody with the Bank of England and the Bank for International Settlements. In November 2009, the RBI concluded the purchase of 200 metric tonne of gold from the IMF, under the IMF’s limited gold sales programme. The purchase was an official sector transaction and was executed over a two week period during October 19-30, 2009 at market-based prices. As a result of this purchase, the RBI’s gold holdings have increased from 357.75 tonne to 557.75 tonne. Following the commitment made by India as part of the G-20 framework, the RBI has agreed to purchase SDR denominated notes from IMF up to $10 billion. As on March 31, 2010, $317.9 million was invested in notes of the IMF. International Monetary Fund designated India as a creditor under its Financial Transaction Plan (FTP) in February 2003. During April 2009 to March 2010, SDR 130 million was made available to Romania, SDR 50 million to Sri Lanka and SDR 117.93 million to Belarus. The total purchase transactions amounted to SDR 1194.16 million as at the end March 2010. India was included in repurchase transactions of the FTP since November 2005. There were no repurchase transactions during the half year ended March 2010. The traditional trade-based indicator of reserve adequacy- import cover of reserves- which fell to a low of three weeks of imports at end-December 1990 reached a peak of 16.9 months of imports at the end of March 2004. At the end of March 2010, the import cover stands at 11.2 months. ..So when Prime Minister Manmohan Singh sat down for a rare hour-long press conference in Delhi this morning, he, unsurprisingly, faced a barrage of questions on what his government was planning to do to crack down on corruption in high places. Unfortunately, say analysts, his answers did not reveal a more assertive chief executive who was fully in control of the situation. For one, say critics, the reticent Mr Singh appeared to be more bothered by how India's image might have been damaged by the media coverage, than by the rising tide of corruption itself. He gave reassurances that the government was "dead serious" in bringing to book "all the wrongdoers regardless of the positions they occupy". When pressed further, he said: "Wrong doers will not escape this time." But he also worried that in "projecting" (read, the media reporting) these events, "an impression has gone round that we are a scam-driven country". This was, he felt, "weakening the self confidence of the Indian people". He told the journalists: "In reporting the affairs of our nation, you should not focus excessively on negative features." Many find Mr Singh's plea disingenuous as India remains one of the most corrupt countries in the world, and graft continues to eat away at its vitals. It hurts the poor most, widens inequity, kills initiative and saps energy out of society. For all its foibles, India's noisy and vibrant media has done more than a good job in relentlessly chasing the alleged scandals - from alleged underselling of telecom licences to purchases for last year's Commonwealth Games. India's merchants of feel-good, however, insist that to highlight corruption at the cost of the country's considerable achievements - and there are many - is wrong. Critics say Mr Singh should not be worrying about the self-confidence of his citizens. The rising self confidence of Indian people, they say, is despite the weak and ineffectual state; and it mostly comes from the opportunities they have been able to mine for themselves in a highly competitive nation. Indians may be inured to corruption, but the recent spate of allegations has taken their breath away. Many believe that the time has come for an all-out war against corruption, something consecutive governments have been loathe to do. So, few believe the government when it says it is moving to bring back illicit money that Indians have stashed away in foreign banks. People believe there is a silent consensus among political parties to go soft on corruption. Nothing much has changed during Mr Singh's regime, they say, despite his exhortations and promises. Factory output in India grew by 3.6% in February compared with the same month a year ago, according to the latest figures. Analysts had expected industrial production to grow by more than 5%. The numbers were pulled back by an 18.4% fall in capital goods output during the month. Manufacturing, which accounts for 80% of overall industrial output, rose by just 3.5% in February, compared with growth of 16.1% a year earlier. However, analysts say that the numbers are not a cause of worry as of yet. "The fact that IIP has come in lower-than-expected is not surprising, as the high-base effect is still playing a part, especially in the manufacturing sector," said D K Joshi of CRISIL in Mumbai. "But this should start changing by the time April, May data are due," he added. Mr Joshi also said that the weak numbers were unlikely to have any impact on the Reserve Bank of India's monetary policy. "Monetary policy is likely to remain on tightening mode given the inflation pressure and strong private consumption," he said. "We may see a 25 basis point hike in May from the central bank," Mr Joshi added. India has reported weaker-than-expected growth numbers for the first three months of the year. The country's economy grew by 7.8% in the first quarter compared with the same period last year, the latest government figures showed. For the financial year to March, the economy grew by 8.5%, lower than the government's forecast of 8.6%. India is one of the fastest-growing economies in the world, but has been hit hard by rising consumer prices. Analysts say a surge in prices of essential commodities, coupled with measures to cool the economy, has started to take a toll on growth. "Raging inflation and a gradual increase in borrowing costs has dampened domestic demand, alongside lacklustre investment sentiment," said Radhika Rao of Forecast Pte. The central bank has increased interest rates nine times in 15 months. The last rise on 3 May boosted the benchmark interest rate by 50 basis points to 7.25%. "We have a situation where inflation is uncomfortably high, so the authorities are tackling it by raising interest rates," said Justin Wood of the Economist Corporate Network. "Obviously this tightening environment has been slowing things down." he added. India's economy has posted robust growth since the global financial crisis. However, the Reserve Bank of India's monetary tightening policies have seen a loss of momentum. Analysts say that as the central bank continues its fight against rising prices, the pace of growth is likely to be slow for some time. "I think this loss of growth momentum will continue for industry for a quarter or two because we are not yet done with interest rate hikes," said Shubhada Rao of YES Bank. However, analysts warned that though a slowdown in growth had been broadly expected, continued loss of momentum would have an adverse effect on the economy. "It is significant because it is the first quarter of sub-8% growth since the crisis," said Sonal Verma of Nomura. China's economy expanded 9.7% in the first three months of this year compared with the same period the year before. "They would love to emulate China's growth, but we don't think they are there yet," said Mr Wood. After posting strong growth for two consecutive years, India’s economy appears to be slowing, with high inflation and rising interest rates. But even with the slowdown, the economy is still among the world’s fastest growing. When India’s economy grew by 7.8 percent in the first three months of the year - its slowest pace in 15 months - economists were not surprised. D.H. Pai Panandiker, who heads the RPG Goenka Foundation in New Delhi says growth was expected to take a hit after nine interest rate hikes in just over a year by the Reserve Bank. “Interest rate has gone up by nearly three per cent in the last one year, so that is having its toll on everything, on the market, the investment, the durable consumer market and so on,” explained Panandiker. The higher cost of borrowing money is affecting several sectors of the economy. Car sales have slowed. Industrial production has fallen. Indian stock markets have lagged behind others in Asia. The interest rate hikes are meant to tackle inflation, which has hovered around 10 percent for almost two years, and is among the highest in emerging economies. But efforts to control rising prices have had little impact so far. On the other hand, surging international crude oil prices have added to India’s worries and prompted the government to raise gasoline prices by 9 percent two weeks ago. The move could further fuel inflation. As a result, the recent interest rate hikes are expected to continue - another is expected in mid-June. Economist Panandiker warns that the government’s estimates of about 8.5 percent growth this year are unlikely to be met. But there is a positive prospect for the economy. Meteorologists have forecast that monsoon rains, which are critical for farmers, will be normal. A good monsoon usually helps cool food prices. And while growth may be slowing, India is still forecast to remain the world’s second fastest growing major economy after China this year. The latest quarterly profits from India's second-largest computer outsourcing company also narrowly missed market targets. Infosys made a net profit of $384m (£243m) in the three months to 30 June, up 18% from a year earlier. Its revenues for the quarter increased by 23% to $1.7bn. Infosys said it added just 26 new clients during the three months and that it was having to pay higher wages to attract staff in India's competitive computer industry sector. The company said it was being affected by global economic uncertainty. "This is an environment where we need to be cautious. You can look at all the things which are happening," said Infosys chief operating officer SD Shibulal. "There is still economic instability... there is the European crisis still unfolding. There is always talk about the government spending coming to an end." Industrial output grew by 5.6% in May compared with the same month last year, latest government data showed. Manufacturing, which accounts for 80% of overall industrial output, also rose by 5.6% in May, compared with growth of 8.9% a year earlier. The figures come at a time when India has been tightening its monetary policy in an attempt to rein in growth. 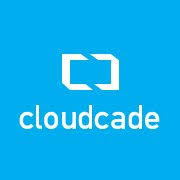 "Overall, the data provides further affirmation of the moderating growth trends," said Radhika Rao of Forecast Pte. India's economy has witnessed robust growth in the past couple of years. However, the success has come at a price. Consumer prices in the country have surged, affecting the cost of living and becoming a hot political issue. Analysts said that with the government focusing on controlling prices, other sectors are likely to suffer. "We are seeing definite signs of slowdown in interest-rate sensitive sectors," said Rupa Rege Nitsure of Bank of Baroda. However, despite the slowdown, analysts said that it was unlikely that the government would change its focus. They said that given the robust expansion that India's economy has seen in recent times, the current figures are not likely to have a big impact. "A period of subdued growth should not be a major concern for the authorities," said George Worthington of IFR Markets. "This data is unlikely to prevent the RBI from further modest tightening in the second half," he added. Mr Worthington added that manufacturing activity was likely to improve in the coming times "as new investments come on stream, allowing a faster rate of growth without adding to inflationary pressures". With fiscal year 2011 ending, Pakistan’s main stock index, the KSE-100 Index showed impressive growth of 28.91%, closing at 12,532.28 points. The other component of capital markets, the debt side, saw Engro Corporation breaking barriers and coming up with a Corporate Bond for retail investors. Buoyed by raising Rs4 billion at 14.5% for a period of three years, Engro again came to the market in the first week of June 2011, targeting another Rs3 billion on the same terms. With the debt market largely run on over the counter trades between financial institutions, the equity markets act as a barometer for any economy. India had managed to hold onto the select league of the countries with a trillion-dollar stock market by a whisker for past few days, but finally gave in today after the market barometer Sensex fell to a fresh 28-month low and the rupee lost further value against the US dollar. At the end of today's trade, the total size of the Indian market, measured in terms of cumulative valuation of all listed stocks, stood at Rs 52,60,440.78 crore. As the rupee ended the day at Rs 52.87 level, the stock market's size in the American currency was USD 994.97 billion -- just a shade below the trillion-dollar mark. The Indian market had a size of USD 1.0116 trillion (Rs 53,48,352.02 crore) at the end of yesterday's trade. A total of 13 countries are now estimated to be left in the trillion-dollar stock market club, including the US, the UK, Canada, Brazil, Australia, Hong Kong, South Korea, China, Japan, Spain, Germany, Switzerland and France. The Indian market had first achieved a trillion-dollar size about four and half years ago on May 28, 2007, but moved out of this coveted league about a year later on July 1, 2008. India again joined this elite club of markets with trillion-dollar valuation about a year later on June 3, 2009. The Indian market was, in fact, seen inching towards the two-trillion dollar mark at least twice in the past -- first in early 2008 and then at the beginning of 2011 with a size as high as USD 1.9 trillion. A sharp plunge in the market this year has led to the Indian market valuation falling by close to Rs 20 lakh crore (over USD 500 billion), from about Rs 73 lakh crore (USD 1.7 trillion) at the beginning of 2011. The rupee has been a declining trend for many months now and had hit its record low level below Rs 54-level last week, but the fall was somewhat arrested since then on the back of an intervention by the Reserve Bank. The market size has been hovering above the trillion- dollar mark for last few days and an eminent miss was averted on Thursday last week, when the RBI managed to reverse the downfall of rupee after a record fall to Rs 54.30 level. On Friday, the market size stood at Rs 54,11,301 crore or USD 1.026 trillion, based on that day's currency rate of Rs 52.30, as the market tanked sharply. The trillion-dollar tag had been lost that day itself, if the rupee had managed to hold onto its record high levels. In terms of individual exchanges, the total size of stocks listed on the NSE yesterday itself slipped below trillion-dollar mark to USD 989 billion (Rs 52,30,333 crore). At the end of today's trade, NSE-listed market valuation stood at Rs 51,42,566 crore (USD 972.68 billion). However, the market valuation of NSE-listed companies is not considered as the country's stock market size, as not all the companies are listed on this exchange. Indian stocks are mainly listed on two national bourses, the BSE and the NSE, but the numbers of listed companies on the two stock exchanges differ sharply. While about 1,600 stocks are actively traded on the NSE, the number is almost double at over 2,900 at the BSE. Almost all the stocks listed on the NSE are also listed on the BSE and therefore the cumulative valuation of companies listed on the BSE is treated as the total market size. India is more problematic. 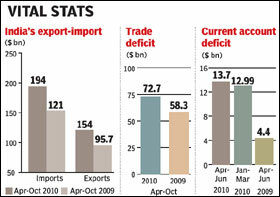 As the only economy in Asia with a current-account deficit, its external funding problems can hardly be taken lightly. Like China, India’s economic-growth momentum is ebbing. But unlike China, the downshift is more pronounced – GDP growth fell through the 7% threshold in the third calendar-year quarter of 2011, and annual industrial output actually fell by 5.1% in October. But the real problem is that, in contrast to China, Indian authorities have far less policy leeway. For starters, the rupee is in near free-fall. That means that the Reserve Bank of India – which has hiked its benchmark policy rate 13 times since the start of 2010 to deal with a still-serious inflation problem – can ill afford to ease monetary policy. Moreover, an outsize consolidated government budget deficit of around 9% of GDP limits India’s fiscal-policy discretion. IN A world economy as troubled as today’s, news that India’s growth rate has fallen to 5.3% may not seem important. But the rate is the lowest in seven years, and the sputtering of India’s economic miracle carries social costs that could surpass the pain in the euro zone. The near double-digit pace of growth that India enjoyed in 2004-08, if sustained, promised to lift hundreds of millions of Indians out of poverty—and quickly. Jobs would be created for all the young people who will reach working age in the coming decades, one of the biggest, and potentially scariest, demographic bulges the world has seen. But now, after a slump in the currency, a drying up of private investment and those GDP figures, the miracle feels like a mirage. Whether India can return to a path of high growth depends on its politicians—and, in the end, its voters. The omens, frankly, are not good. Is it time for a change at the top? Mr Singh has plainly run out of steam, but there are no appealing candidates to replace him. Mrs Gandhi’s son, Rahul, has been a disappointment. What about a change of government? The opposition BJP is split and has been wildly inconsistent about reform. Its best administrator, Narendra Modi, chief minister of Gujarat, is divisive and authoritarian. If it formed a government tomorrow, the BJP would also have to rely on fickle smaller parties. Some reformers pray for a financial crisis that will shake the politicians from their stupor, as happened in 1991, allowing Mr Singh to sneak through his changes. Though India’s banks face bad debts, its cloistered financial system, high foreign-exchange reserves and capable central bank mean it is not about to keel over. A short, sharp shock would indeed be useful, but a full-blown crisis should not be wished for, because of the harm that it would do to the poor. Instead the dreary conclusion is that India’s feeble politics are now ushering in several years of feebler economic growth. Indeed, the politicians’ most complacent belief is that voters will just put up with lower growth—because they supposedly care only about state handouts, the next meal, cricket and religion. But as Indians discover that slower growth means fewer jobs and more poverty, they will become angry. Perhaps that might be no bad thing, if it makes them vote for change.